I had what I consider to be a rather telling moment in the greenhouse this weekend. I was planting out week-old lettuce seedlings that’d seen their first seven days under the lights indoors, when it started raining. Actually, it had been raining all day, not hard, but now it started pouring. As the downpour drummed the plastic, I realized I was getting wet: it was raining on ME. Looking up to see what kind of hole to expect, thus assessing what kind of greenhouse repairs need to be added to that growing list of spring chores I…laughed out loud. Yep: it was merely raining so hard that the ever-present condensation was simply getting knocked off the plastic, thus, raining indoors. I haven’t had many laugh-out-loud moments in these last few months so this was quite welcome. Nancy Bubel suggests that the tiny cold-loving seedlings like these lettuces can handle the stress of transplanting better than their bigger siblings, and I agree with her. It is a bit of a tease pulling these little things out of their crowded pots but the longer I wait the more tangled their roots become. 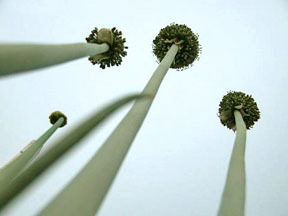 The stems, likewise, on older seedlings are taller and weaker and thus are more prone to damage. I simply pry the entire plant out of its cottage-cheese cup with a screwdriver and lift it gently by its leaves to plant it in a waiting hole drummed into the bed with my handy dibber. The hole is about 2″ deep, as are the roots; the plants are maybe an inch tall above ground. This entry was posted in seeds, weather. Bookmark the permalink. That sounds like a great day. My lettuce seedlings do not like being transplanted. Not this year, and not last year. They’re slightly older than yours, but they have spent the last few days outside instead of under a grow lamp (zone 7 here). It is very frustrating; I have not had much success at all at starting lettuce from seed. My tomato seedlings keep succumbing to damping off this year, and I don’t know why. Last year I didn’t lose a single tomato plant. At least my pepper seedlings are looking very healthy. They were a complete disaster last year – we ended up having to buy all but one of our pepper plants. This year it looks like we might have more than we need. Harmony, you might try direct-seeding the lettuce seed. Once you plant the seeds, you can warm up the soil by putting (and holding down with rocks or whatever) a piece of plastic down atop the dampened soil. Just watch for emergence; it’s probably pretty warm during the day so it won’t take long. You can transfer them later when they’re bigger. The plastic trick works for all kinds of stuff, just make sure you don’t bake them once they’re up! Damping-off is a great mystery to all of us. I was hoping for rain – which is greatly needed – last night, but all we are getting is wind and warm temperature. Sigh. I am with you on lettuce transplanting. I prefer to start mine in cell pack, and then transplant. I just don’t do as well (for early lettuce) direct-seeding. I have not had problem with damping off in years. I credit it to good ventilation, moving flats outside if the temperature is mild enough and using grits to top off the seeds. Thanks for the tip with the plastic in late winter/early spring. I tend to use folded Reemay, but the plastic would warm the soil better. As you say, make sure to remove as soon as germination occurs. Rain on the face is quite a welcome feeling, just had a warm rain spatter yesterday. The promise of spring! Your lettuces look great, we’ve just got a few seeds up. Oh, for that first salad in the spring! 🙂 That’s funny! Interesting about the young seedlings transplanting better, I’d have guessed the opposite, but in a way, I can see why. I’ve started in pods/cells…. would you think keeping them covered/domed would be better, or having the ventilation? Harmony, I do know that I’ve only had damping-off problems with “live” soil, but the dead seeding mixes you get at the store seem to be fine. Can you make sure they’re fairly well ventilated? Sylvie, grits? (When in Rome I guess, right?) The plastic trick works pretty well. It’s clear; it’s left over from doing the greenhouses, and it’s how I keep the greenhouse seedlings warm at night now because it keeps them fairly moist too. WS I go through that period from April to June so I understand! But do get busy on those seeds seeing as your growing season has that bad too-hot hiccup in it from Jul-Sept. But I am glad to hear you like the greenhouse stories: they’re the only kind I am going to have for months yet! Freija, you of all people I can see doing a hot coldframe because of all the poop you have from that lovely horse. Oh and nannyberries too. Have you and Mr ever considered it? I ask because your house is probably as cold as mine and as you know the little seedlings don’t have the option to put on sweaters like we do. Anyway, good luck with your starts: salads can’t be too far away! MC, I have had so-so luck with those plastic lids. I tend to use them only on the tomato/pepper starts because they’re so sensitive to drying out, but after the first week or so they’re not terribly useful. Yeah it is something of a dance of heat/moisture/light/ventilation and too much of one will doom the seedlings. Don’t fret though because most of them are fairly tough. Just keep your eyes open! Well I think I’ve done just about everything I could to avoid it. I sowed them in sterile soil that I bought this year (not from a bag that sat out in the elements all winter), I watered with new water and chamomile tea (just in case), and they have been outside every single sunny day we’ve had since they sprouted (maybe 7 to 10 days ago? ), as the temperature consistently hits 70 in the sun these days and that’s warmer than inside our house. Here’s the really strange part: I sowed 54 tomato seeds of 3 different varieties (18 of each) – Roma, Mortgage Lifter, and Yellow Brandywine. I sowed them at the same time, from the same soil, watered them with the same water, put them in the same location to germinate, moved them to the same sunny spot outside after germination. I haven’t lost a single Brandywine out of the ones that germinated. I’m down to a half dozen each of the Romas and Mortgage Lifters, and there are several more that are just barely hanging on that I will probably lose in the next day or two. Well I have 3 full flats of seedlings, germination seems to be 100%…then today we get a call from the city ordinance denying our request for a greenhouse…something about vermin and high winds…I’m hoping we can talk some sense into these people…modify the structure we had in mind to suit their fancy…if it can be done within our tight budget. Have you had any issues with mice,etc. in your greenhouse? Has it weathered storms well? Harmony, you know, you might just have had bad/old seed. What I do know about disease-resistance in larger plants is that those which were the hardiest seedlings also have the most immunity to either bug predation or fungal stuff. I’m thinking especially about my bang-up harvest of squash last year: I moved my compost piles and planted corn and beans in that spot and just let the volunteer squash grow. These guys had so much more resistance to squash bugs than the precious things I had actually seeded! Anyway, it seems like you’re doing everything right, but I am glad you’ve got more seeds coming. And this year I will be trying Mortgage Lifter too for the first time; I got it in a seed trade so I am excited. Sylvie, well, I was wondering! I know that corn grits have inhibiting properties so folks use it around their plants to keep the weeds down. That sounds like wasting food to me (and what’s wrong with a hoe). But okay I know what you mean now! Thanks for the hoophouse cheering! Do you heat your hoophouses at all, or is it all passive? Do you start seedlings in the hoops? If so, what’s the temperature range that you consider acceptable for hot weather crops like tomatoes and peppers? We’re having last-minute worries about it getting too cold for our seedling babies in our unheated hoophouse. At this time of year here in the mercurial southern appalachians, it can get up above 70 during the day but down perilously close to freezing at night. I haven’t been able to find good information on the issue of RANGE of temperatures – it will definitely get hot enough for things to germinate in there in the daytime, but does that temp need to be maintained or consistent? Cause if so, we’re in trouble. Ah, Milkweedy! I was JUST thinking about you when I spent the last hour or so in my 90* greenhouse, sitting and mostly thinking. At this time of year I am getting 60-70* temperature shifts daily. That’s a lot, but then, that’s what you expect at the non-high season. In other words, winter and high summer temp shifts end up being more like 40*: from 20-60, say, in a really cold, mostly cloudy winter day, and 60-100 in the average June or September. LOTS of things can grow, you know, in those temp extremes. Nothing but the sun here; no extra tricks, unless you count Reemay and raised beds. I start SOME seedlings in the hoophouses, mainly salad things. For the sake of “helicopter parenting” or whatever you’d like to call me I do start most things indoors and simply shift them outdoors once I think they’ve reached adequate size. Last weekend, for instance, I transplanted my lettuce seedlings out to the old greenhouse, right next to the seeds I put in the ground in late Jan and mid Feb (those lettuces were slightly smaller). This weekend I am transplanting some onions, all started in Feb. Next week it might be the rest of the broccoli/cauliflower starts. This all happens whilst I seed certain rows out of doors, and make mad harvests in between with what’s going on out there with the salads that are already there. As far as my tomatoes and heat-loving things, I keep an eye on my min/max greenhouse thermometer. Once it never falls below 40* at night I feel it’s okay to put out the tomatoes. So in other words I haven’t even started seeds yet on those crops; I am in no hurry (it takes them 8 days to germinate, 14 days to get big enough to transplant out: in other words, it’ll be April, about 4 weeks before last frost here). And I DO transplant my little tomato, etc. seedlings directly into the soil of the greenhouse’s raised beds. I can’t improve on nature: my basement lights will never be as full-spectrum as that sun nor will my bags of soil ever be as nutritious as real earth. So get a Min/max thermometer to see what the range is, but more importantly make sure your soil is warm with a soil thermometer. Mine never froze in the greenhouses, not deeply: if yours was open-ended all winter then that soil is probably not terribly warm and it will take a while to warm up unless it’s been enclosed for a while… My soil is now (at 5:30 pm after a cold but sunny day) 65* at 2″…and it will drop to 45* overnight. ooooooooooooh, thank you for such a thorough reply. very helpful! we do have a min/max thermometer in there now. and raised beds are in the works….but i think we’ll be able to do most of our starts in the hoops and just make sure that we never let it get below 40-45 or so. and do your geese (testosterone-poisoned or not) do a good job on slug patrol? ducks are in our plan for next spring….